So far its been a very dry summer here on the Alley. Very little rain has fallen and the rivers have slowed to a trickle. The weather all week was hot and humid. That usually keeps the fish lying in wait until the evening hours. After doing some Saturday yard work, I decided to head down to the Rocky. I made my way to the pools behind one of the golf courses in the reservation. 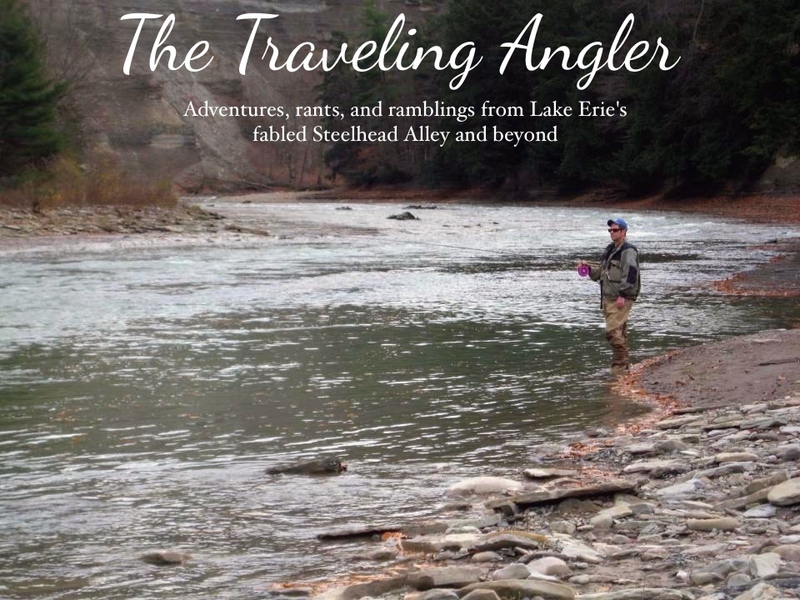 This section of the river is very popular with steelheaders as it’s one of the deepest sections. During the summer months, the pools are inhabited by carp, channel catfish and smallmouth bass. As I walked along the river, being mindful of errant golf balls, I noticed it was full of algae. The river was extremely low and I could see the remains of redds dug out by steelhead way back in April. As I walked I could see several carp feeding in very shallow water. The water was probably no more than a few feet deep. As I continued down to the bend, I noticed a very large school of carp mingling in the riffle. There were about 40 fish lazily swimming and holding in the shaded sections. I reached into my bag of carp chum and tossed some out. I stood at the top of the riffle and placed a couple kernels of corn on the hook. I casted out and let the float drift downstream. Standing on top of the rock I could the carp methodically sifting through the bottom. Due to the easy visibility, I could see the fish taking the bait and quickly set the hook. It wasn’t a large fish, but it made a run for the downed tree. Due its small size, I easily steered it away from it. It was an average sized fish weighting a little more than 6 pounds. I continued to fish the riffle and picked off several more. The remaining fish scattered into the deeper water and it was time to change tactics. By now it was almost 7:00 P.M and I switched to catfish mode. For catfish, I use the same setup for steelhead. Instead of eggs or shiners, I use chicken livers. Generally, I like to use spawn sac netting for the liver as it easily tears off the hook. But, I didn’t have any netting so I had to make due with placing small pieces on the hooks. I moved downstream to section with some downed trees as catfish love to hide in lumber. I tossed some liver into the water and waited several minutes to see if I could get anything stirring. 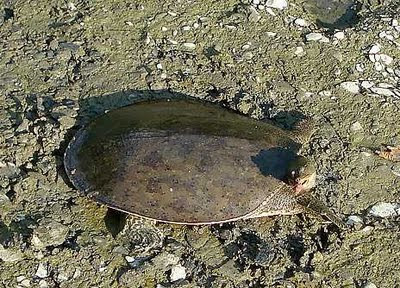 It wasn’t catfish that appeared, but soft shelled turtles. Periodically they surface and quickly go back under. All of them were fairly small and I figured sooner or later I would probably hook into one. I drifted along the trees and didn’t get any hits. I told myself I would give it a few more minutes and head to the larger pool. I watched the float drift along and it went down hard. I set the hook and immediately I could tell it was a turtle. I managed to get to the surface and it was a fairly large one. As a kid, I remember hooking into several snapping turtles and remembered wisely cutting the line. Even though soft shelled turtles were smaller than snappers, they were just as ill tempered. I managed to get it close to shore, but the turtle wouldn't come out of the water. He dug in his front feet and stubbornly refused to leave the water. I finally dragged him onto the shore only to have him try to head back into the water. I didn’t want to cut the line as I felt I could remove the hook. It was a feat in trying to remove it as I yanked his neck out. It was like trying to remove a hook from a rubber band. The turtle protested by pulling away. After several attempts I managed to get the hook out and watched him quickly return to the water. After that I packed the gear up and headed to the larger pool. The larger pool was about 100 yards downstream and I walked along the bank. The large trees along the pool blocked out the sunlight. By now it was dusk and I figured the catfish were on the prowl for food. This pool is deep by Rocky River standards with a depth of 4 to 5 feet. I started at the head of the pool and tossed out the float. The current was very slow and I figured this would give the fish more time to find the bait. It took some time to find the fish and I they were holding tight along the undercut of the bank. Just like the carp in the river, the catfish are often small usually weighting a couple of pounds. In the spring, I’ve heard of some lunker cats being taken in the lower section. Due to the lack of depth and forage, there are not many holes for cats to find. It gradually got cooler and the fish started to get active. As I was reeling in the float, the water's surface exploded. I took me by surprise and I was stunned. 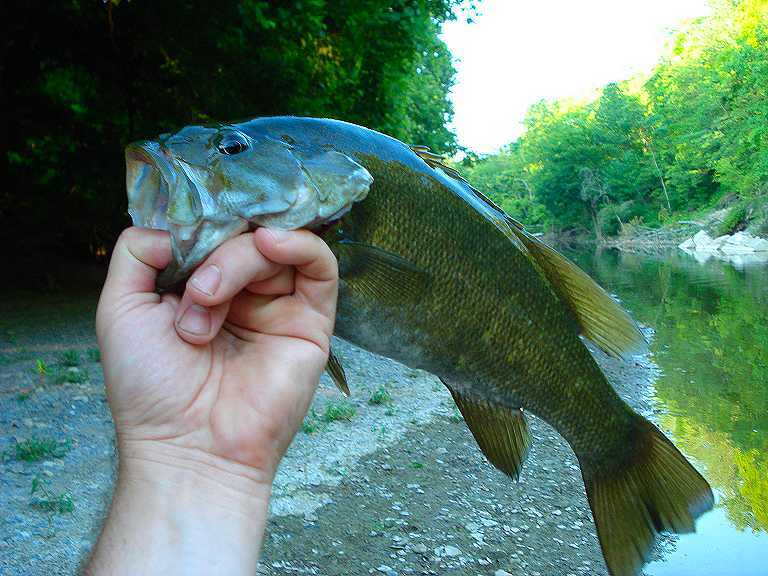 Then the line stiffens and it was a decent sized smallmouth bass who mistaken thought a piece of liver was a minnow. The numerous shiners kept this fella plump and healthy. By now, it was gradually getting darker and I had about an hour before it got dark. I caught a couple more dink catfish and then nothing. I was surprised that there should have been more fish. I decided to pack it in and wondered how the fishing would have been after sunset. After dark is when catfishing is at its best, unfortunately park rules don't allow people fishing after 11:00P.M. Hopefully, next week I can head out to the big pond for some perch.